The baby alphabet game is a fun quick baby shower game that will have your guests racing to come up with baby related words for each letter of the alphabet. You can ask guests to name all sorts of words for each letter based on pregnancy, baby related words or names for the baby. Play with all guests, young and old but only guests that are quick thinkers will come out as winners. 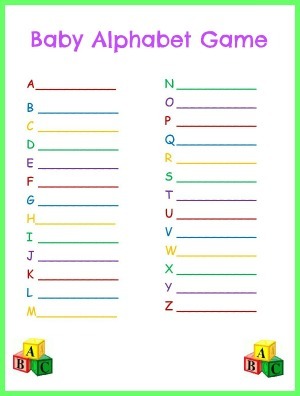 Print out a copy of the baby alphabet game sheet for each player and provide pens or pencils to fill in the information. Advise guests that they have 2 minutes to write down a baby related word for each letter of the alphabet. The guest that has the most words when time is up is the game winner. Make sure to have a sheet filled out with some words of your own in case guests ask for baby related words for a letter they could not think of. Here is a free printable baby shower alphabet game sheet. Play the alphabet game as a fun gift opening game. You can make the gift opening section more interactive for all by playing a game that will keep everyone interested during the gift opening section. Give each guest a pen and a sheet of paper with the letters of the alphabet listed A-Z. Tell each guest they should write down one gift item for each letter that they think the expectant mother will receive. When mom-to-be starts opening gifts tell everyone to have their sheet ready. If mom to be gets a gift that they have written down then they get 1 point.The winner is the guest who has written down the most gifts given to mommy from A-Z.